Mud Island isn't actually an island; it's a small peninsula of land that juts into the Mississippi River off downtown Memphis. Some have even dubbed it the city's "Gulf of Mexico." But that fact doesn't make it less fun. For decades families have been heading here to relax alongside the water, celebrate the mighty Mississippi River, and participate in lively social and cultural events. The park might be most famous for its Mississippi River Museum where visitors of all ages can master the river's 10,000 years of history. Mark Twain, steamboat disasters, river folklore, the museum showcases it all. There's even a scaled replica of the entire river that you can walk along. Another popular activity is to rent paddle boats to take in the views of downtown Memphis by water or sit at one of the riverside cafes. Many people head to Mud Island for special events. World renowned musicians love playing in the 5,000 seat amphitheater because of its outstanding acoustics. Mud Island was formed more than 100 years ago when sand, gravel, and of course mud piled up in front of the Memphis harbor. There is one theory that a warship named the USS Amphritrite got stuck there for two years causing a greater pile up around its stern. Others believe that the island was simply formed by the ebb and flow of the river. In the 1920s, '30s, and '40s, squatters lived on Mud Island. It wasn't the best idea because high waters would frequently flood the island and destroy their homes. In 1958 a small airport was built on the peninsula with a 3,100-foot runway. Memphis archives showed the airport was very popular among businessmen who wanted to land very close to downtown Memphis. The airport closed in 1970. On July 4, 1982 The Mud Island River Park opened for recreation. The city spent $63 million to build it. One of the highlights was the new amphitheater. Big names like Andy Williams flocked there to play in it. Johnny Carson made fun of its name on the Tonight Show giving it even more publicity. In May 2018 the city received the green light to pour millions of dollars into more development for the park. There are negotiations under way to build a state-of-the-art aquarium. One of the highlights of Mud Island is The Riverwalk. 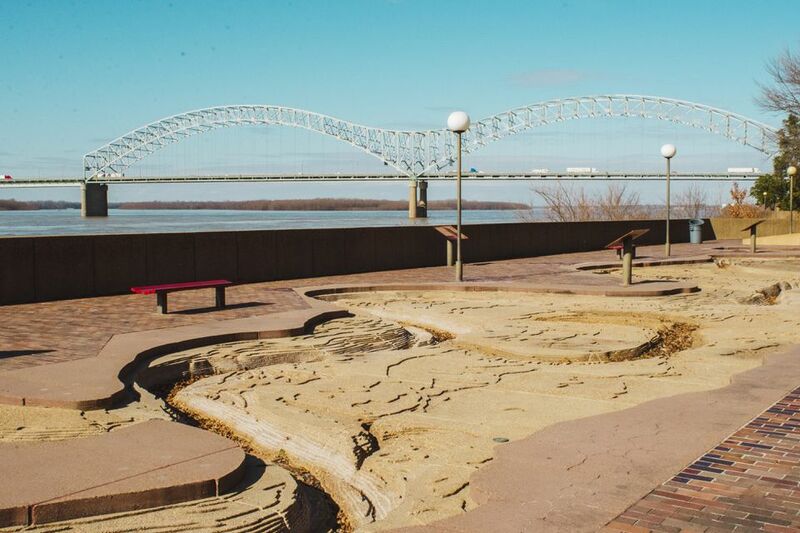 It's a concrete model of the lower Mississippi River, and it's designed for you to walk along (at some points you can get inside it because the water is wide enough!) You'll see how the body of water flows for 954 miles. The river passes through 20 cities and watersheds, all highlighted on the model. It spans five city blocks. The Riverwalk is part of the Mississippi River Museum. There are 18 galleries that tell you about the history, the people, the engineering, and the myths of the Mississippi River. You'll see a life-size replica of a riverboat and hear the stories of adventurers who made a living on this waterway. There are five galleries dedicated to Civil War history, there is even a gunboat. The museum is open Wednesday to Sunday from 10 a.m. to 5 p.m. Adults $10, Youth 5-11 $8, children 4 and under free with an adult. After you've learned all about the Mississippi River, go for a paddle boat journey on it in a special area set aside for recreation. You can rent the boats at a booth located at the museum's exit. It costs $5 to rent a boat, a bargain considering the stunning views of downtown Memphis you'll take in along the ride. Beneath the Memphis City Skyline is the Mud Island Amphitheater. This 5000-seat, open-air theater, has attracted the biggest names in music. In the 1980s the Beach Boys were regulars. In 2018 Alison Krauss made an appearance. Nora Jones, Widespread Panic, Journey, the Alabama Shakes, they've all played here. Events occur in the summer. You can buy tickets and see the lineup at the park's website. There's a café inside the museum where you can get reasonably priced sandwiches, salads, and snacks. Near the paddle boat area there is also a park where you can bring your own picnic or grill. For a more formal dining experience head to nearby Harbor Town. Tugs is a family-friendly restaurant that serves local craft beer with great sunset views. On the roof of the River Inn of Harbor Town you can enjoy happy hour drinks and snacks while you watch the sky change colors. Cordelia's Market is a community grocery where you can pick up gourmet meats, cheeses, salads, even ice cream for a picnic alongside the Mississippi River. Regardless of why you're going to the island, part of the fun is getting there. The park is officially part of Memphis, locationed 1.2 miles from the coast of downtown. You can get to Mud Island by taking a walk on the footbridge (located at 125 N. Front Street) or riding the monorail over the Mississippi river. Both options afford stunning views of the river. The park is open every day in spring, summer, and fall from dawn to dusk. Admission to the park is free but museum, activity, and concert tickets cost extra. It is closed in winter. Bikers are allowed on the island; there is a special entrance for them at Northgate. Garage parking is available for $6 and must be paid for with a credit card.